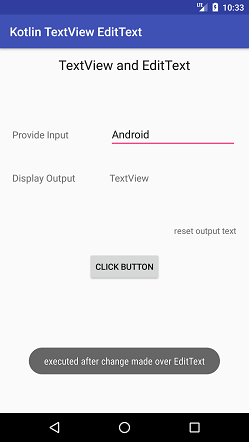 Android TextView is a user interface which displays the text to the user. 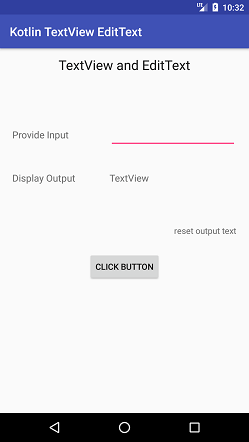 A simple XML code of TextView in a layout is shown below. 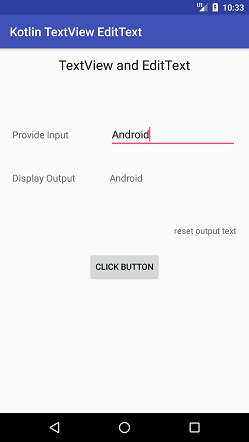 The EditText is a user interface which is used for entering and changing the text. While using edit text in XML layout, we must specify its inputType attribute which configures the keyboard according to input type mention. The simple XML code of EditText in a layout is shown below. In this example, we input the text value in ExitText and display its value in the TextView on clicking the Button. We are also watching the changes made over EditText using addTextChangedListener () method and TextWatcher interface. In the activity_main.xml file add the following code.